Urgent maintenance requests, unexpected breakdowns or quality issues are a common scenario on a shop floor, e.g. in manufacturing or supply chain logistics. Response is of critical matter as equipment breakdowns or quality problems bring your operations to a grinding halt. When a machine breaks down or malfunctions, a maintenance engineer on duty or on call needs to be called, usually through the machine showing blinking red light or manually by a machine operator using a landline phone that is located somewhere on the shop floor. With more digitized manufacturing, an (I)IoT platform or SCADA system might recognize the break down and display an indicator on computer screen. Control room staff then needs to manually find someone who can take the job. However, this process and related manual dispatching is slow and requires precious human resources. With SIGNL4 maintenance teams become truly mobile. And response becomes much more real-time. Machines or MES and SCADA systems can directly and automatically send urgent maintenance or service requests to teams on duty or responsible workforce. Service dispatching processes become automated. On the mobile app worker see a job queue and can take ownership of tickets, incident alerts and service requests. Operators do see in real-time who responded and who took over which maintenance job. No further communication to search for idle team members or to confirm job ownership is needed. Later shifts can easily see what happened and which jobs were done. The one-touch communication options helps engineers to contact each other to solve problems jointly. An integrated chat allows for real-time communication between experts. Automated mobile maintenance alerts leads to a much faster response to incidents, quality issues, service jobs or even interruption of manufacturing or machinery operations. It significantly reduces the mean-time-to-response. Alerts are targeted to right personnel who is actively on duty. Large and small companies alike are looking for the best approach to embrace the “Industrie 4.0” initiative. Clearly, value comes first and operational excellence is one target. Experts agree on a step-by-step approach. SIGNL4 is a low-barrier entrance to better operations and a building block of the smart and automated factory. The return-on-investment is quick through the simplification and automation of formerly manual processes. 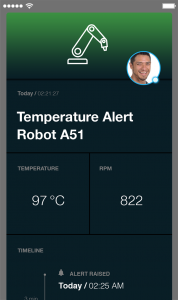 SIGNL4 is an out-of-the-box, cloud-based alerting solution for manufacturing scenarios. It provides provides immediate efficiency gains, transparency and much faster response times. Existing systems such as IoT platforms or more conventional systems like ERP, MES and SCADA can be easily connected, e. g. by email or webhook.